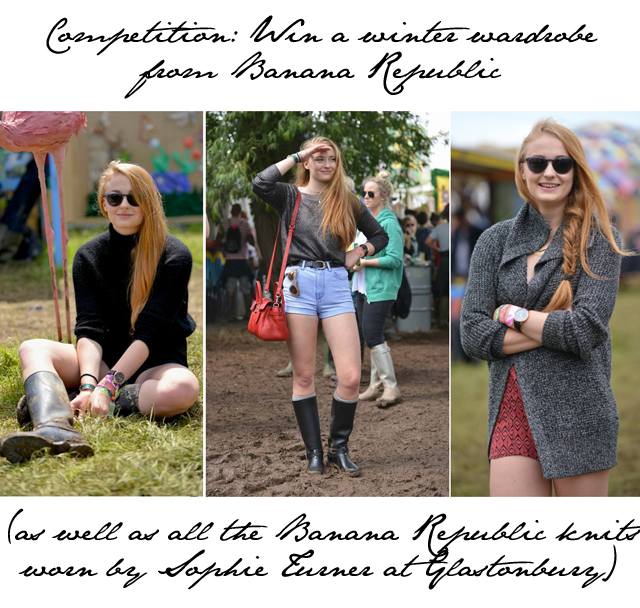 Competition: Win Sophie Turner's Banana Republic wardrobe from Glastonbury plus £1,000 to spend in store! To celebrate the forthcoming arrival of autumn winter 2014 in store, Banana Republic would like to gift one reader of FFG with Sophie Turner's BR pieces from Glastonbury, as well as £1,000 to spend in store when the new season arrives on racks later this year. If you're up for the game, there are two ways to enter. You can either enter by leaving a comment below and subscribing to FFG's Newsletter there on the right of the page or you can retweet the tweet below (just click on the date and it will take you to Twitter to retweet), while also following Banana Republic and Fashion Foie Gras on Twitter. A few minor details that need to be mentioned. This competition is open to the UK only. It will close on Monday, 7th July, when the winner will then be notified and asked to supply their email and address. Good luck one and all! Get in there with entries, guys. This prize is valued at over £1,300. Not too shabby to start off the colder months when they finally arrive.